Here are a couple more shots of Chicago on my travels. This was sunrise last week as I headed north to a job. For those not in the know, this is looking out at Lake Michigan from near the intersection of the lake and the Chicago River. I wish I could get a photo of the sunlight reflected off the condo buildings on the north side of the river. They look edged in gold leaf. Here is a photo taken a couple weeks ago from Navy Pier. One of my best friends, Terry, was in town to do a show at McCormick Place, a behemoth of a convention center south of downtown proper. I drove in to pick her up and go get supper. I decided Navy Pier, which juts into the lake, would be a good place; a variety of restaurants and ample parking. When I picked her up, it was a lovely 70 degrees and sunny. She was staying at a hotel to the left of the buildings on the left side of the photo. It would be a 15 minute drive north to Navy Pier. As we turned onto Columbus Drive to head north, the Jeep was rocked with a blast of wind. We'd had the windows down but the wind coming into the Jeep was about 10 degrees colder than the air temperature when I picked her up. The locust trees in Grant Park, bright yellow, lost a chunk of their leaves which created this yellow curtain as we drove north. The smell of fall in the Midwest was instantly upon us. 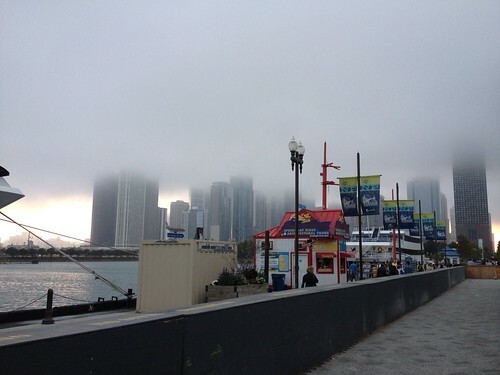 As we prepared to turn right to head into Navy Pier parking, the clouds rolled in. 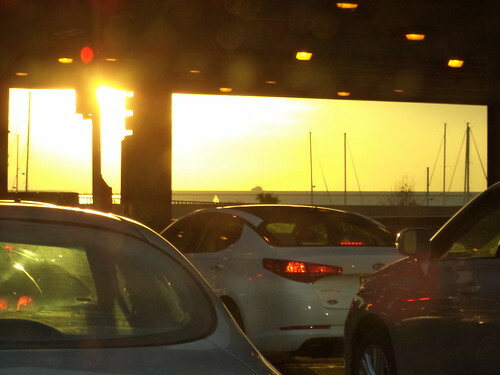 This is the view when we came out of the parking garage to the pier. Skyscrapers in Chicago were effectively cut in two. The predicted cold front had arrived. Although I'm afraid of heights, at a time like this, I wonder what it would be like to be in the clouds or if there was a way to be above these. We had a lovely 2 and a half hour dinner, with very attentive service. The sky grew dark as the sun set. When we left the restaurant, the clouds had passed. I should have tried to take some photos of the night skyline; it's beautiful; but I'd neglected to bring a coat and it was downright cold. There is a joke in this neck of the woods. "Don't like the weather? Wait 10 minutes and it will change." Yeah.